“It’s hot in the desert, and when you can’t do laundry, your feet WILL get a little stinky. That’s when a fresh pair of socks can make all the difference in the world!” Major John Harvey sits in a chair surrounded by first graders at The Lexington School. He’s Calvin’s dad and he’s here to explain why the first grade service learning project OPERATION S.E.N.D. is such a worthy initiative. The care packages the children will build and mail to deployed Kentucky soldiers will deliver food, supplies, socks, and SMILES. A project this size takes a small army of its own. 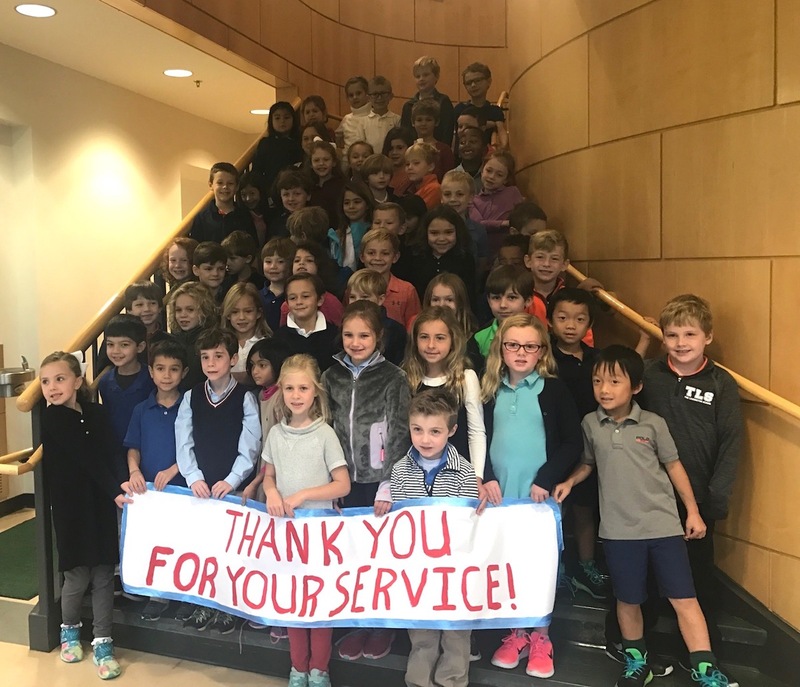 Over the course of ten days, first graders spent time with Major Harvey, friends from Military Missions, and TLS Parent Association volunteers. The children solicited donations of puzzle books, wet wipes, socks, candy, sunscreen, drink powders, snacks, and more, but the time they put into the pictures and letters thanking our Kentucky soldiers will make the biggest difference of all. It is a big hug from home, and it makes home feel just a little bit closer. Service Learning for grade level students requires a thoughtful strategy and preparation. How do you help six year olds understand the gift of time, treasure, and talent in helping others? Let’s learn a little of the life of a soldier through the eyes of someone as familiar as Calvin’s dad, a real man who lived in real Iraq. Let’s make a list to take home to collect some real items that will make a soldier’s life better. Next, let’s take the time to create pictures and letters of thanks, and let’s pack up all that love to SEND to our nation’s deployed. It takes helping hands, so we are thankful to Military Missions, TLS first grade teachers, and the wonderful volunteers of the TLS Parents Association. Operation S.E.N.D is service and learning; it builds ETHICS in first graders at The Lexington School and it builds a bridge to those outside our small community who keep us safe and sound. Watch this short video to see service in action.